Provide comfort for the family of George Dye with a meaningful gesture of sympathy. 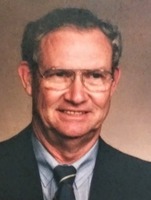 Mr. George Dye, 83, of Cartersville, died on Saturday, January 26, 2019 at his residence. Born on February 21, 1935, he was the son of the late Burl Dye and Beatrice Hight Dye. Mr. Dye retired from Shaw Industries in 1998, having worked as the Maintenance Manager. He was a great carpenter and loved to fish and hunt. He was a member of Tabernacle Baptist Church, loved his family dearly and loved to play his guitar. In addition to his parents, he is preceded in death by his wife of 50 years, Jo Anne Hatfield Dye; and his son-in-law, J.T. Mullinax, Jr. Survivors include his daughter, Sandra Gay Mullinax; his grandchildren, Adam (Elizabeth) Williams, Ashley Dover; his sister, Patricia Taff; his brothers, Bobby (Wanda) Dye, Clayton (Anne) Dye; several nieces and nephews, 5 great grandchildren and 1 on the way. Funeral services will be held at 2:00 p.m. on Thursday, January 31, 2019 in the chapel of Parnick Jennings Funeral Home and Cremation Services with Reverend Cecil Waters and Reverend Kenny Jacobs officiating. Interment will follow in Mountain View Church of God cemetery. The family will receive friends from 5:00 p.m. - 8:00 p.m. on Wednesday, January 30, 2019 at the funeral home. Parnick Jennings Funeral Home and Cremation Services is honored to serve the family of George Dye; please visit www.parnickjenningsfuneral.com to share memories or to leave a condolence message. To send flowers in memory of George Dye, please visit our Heartfelt Sympathies Store. Donations are being accepted for: AMERICAN DIABETES ASSOCIATION INC (NATIONAL OFFICE). Provide comfort for the family of George Dye by sending flowers. My condolences to the Dye family. May God's love and peace comfort you in the days ahead. I remember being small enough to ride Uncle George's calves, like a horse, as he would bounce his leg up and down for me. I loved that man, and will miss him always!